Dedicated to the 61st AHC, 616th Transportation, 922nd Signal, 193rd Medical Detachments, 364th Aviation Support Detachment (ATC), and our aviators and crews whose lives were lost for our country and Allied Forces. E Company, 1st Aviation Battalion, 212th Aviation Regiment will begin using the "Lucky Star" call sign and unit crest after 14 December 2018. 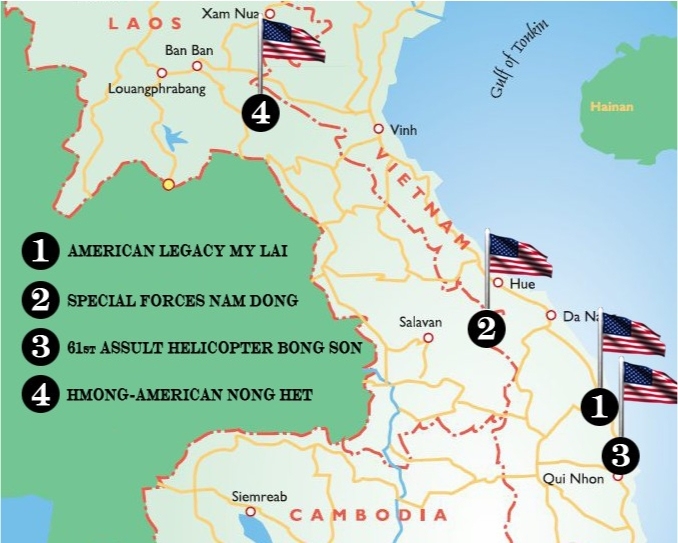 E Company (Blackhawk helicopters), according Echo's Training Officer CWO3 Mark Jordan, held a two month long search for Vietnam War era call signs and unit crests for their current use. The field was narrowed to five and a final vote by E Company and other 1st A.B. members selected "Lucky Star" as the new call sign and unit crest for E Company. A 14 December 2018 ceremony with former 61st A.H.C. members transfering the call sign and unit crest to E Company for it's current use. This is a very proud moment for the 61st A.H.C. soldiers and in Army aviation history! The helicopter #624 operated by the Army Aviation Heritage Foundation asked to perform a fly over. T-Shirts, Coffee Cups, and Baseball Caps! A tribute brick array will cap the 1st Aviation Brigade array and be surrounded by 61stindividual bricks. This also is a great way to support AAMF and give a lasting memory of those men who died in service with the 61st AHC. See Contact information below for more information. The AAMF will leave about three rows of bricks around the 61st Aviation Dedication or re-set bricks for us through the end of 2022. The 61st set an example for other units who have followed with their brick groupings. This is a wonderful time to support the AAMF with your brick order. Please print the order form found below to reserve your brick placement in our grouping. A "Buddy-UP" brick can accomodate 2-3 names sharing one brick. The cost is $50 and $75 shared with your buddy. See Contact below to arrange your Buddy-UP brick with Gordon. This is a beautiful and lasting entry to the Army Aviation Museum. 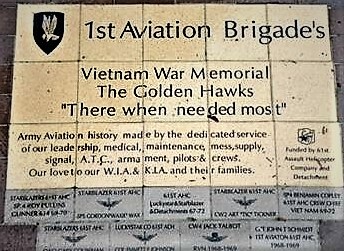 The 1st Aviation Brigade's Vietnam War Memorial brick array was dedicated by about 40 61stveterans and spouses. The commanding general announced our group to a resounding applause! The Bong Son Lucky Star Library Learning Center received and installed ten computers and a large screen monitor supplied by 61st donors. The equipment with five year maintenance contract was well received after a several year wait. The Bong Son Library Project had received a $450 check from the 61st Assault Helicopter Company August 2016 fund drive. It was presented to Chuck Theusch at the 61st A.H.C. Cornfield reunion in late September, 2016. The Lucky Star Library is just over a four thousand square foot structure. The computers were installed in a large activities room dedicated to computer and video training applications. During July 2017 Ken Embers traveled to Korea and Vietnam where he presented English training classes to teachers and students. The "Embers's Bong Son Revisited Report" is now exclusively available here (see link below). This is a wonderful report of American G.I.s returning to the battleground with a mission of peace. The Lucky Star Library is prositively affecting the many lives of teachers and students in Bong Son area. "The 2017 Embers's Report"
If you would like to support this effort, mail contributions to Mr. Ken Embers at 733 Galaxy Drive, Manhattan, KS 66502. Please make checks payable to "LOVP Bong Son" The LOVP/CLI is a non-profit organization so donations are tax deductible. This website is the only site providing information about this project. Below is a map of the 2011 Missions of the Children's Library International. Website provided by Wall-Ties and Forms, Inc.Manufacturer of aluminum concrete formwork and a partner in the Childrens Library International project.